There was a time when it seemed the only question to consider when ordering a burger was whether you wanted fries or not. Now, the options are virtually endless. Would you like gruyère or swiss cheese? Served in a brioche or a black charcoal bun? How about a double beef patty, layered with fried chicken? Or why not scrap the meat all together and try the panko-crumbed mushroom instead? We’ve narrowed down our top burger picks to get you through a long day at work, a relaxed Sunday arvo, or a night out. It doesn’t it get any more Melbourne than burgers and fries served in a graffiti-covered train. On a health kick? There isn’t a salad in sight. Instead, we suggest the Melbourne Madness, with a double-beef patty, double cheddar, bacon, jalapeños, and to top it off – a potato cake and a fried dim sim. Complete your order with a side of creamy mac ‘n cheese, or a milkshake-flavoured custard donut. There’s no room for clean eating hashtags at Coburger & Co – it’s a burger-lover’s paradise. We’re talking Korean fried chicken burgers topped with maple bacon and kimchi, double wagyu, double cheese, double bacon in the Makin’ Bacon Duplex Burger, and the Classy Coburger Chick Burger, complete with chimichurri grilled chicken, cumin labne, and salsa. The nacho-loaded fries need no explanation (drool), but they need to be included in your order. Founder Theo Tzavaras has travelled extensively through California. Hence, the name, and the west coast-inspired menu. It’s all about quality here, with most things made in-house. The buns are fresh, the beef patties are hand smashed, and the special Pink Mayo is homemade. We like the spicy chicken Compton Burger and the epic Muscle Beach Burger with quadruple beef and cheese. Complete your meal with a serve of cheesy American fries, and a soft taco or two if you’re super hungry. Burger Boys provides the ultimate American (and Americana) experience from start to finish. Begin with the Rushmore, with 150 grams of beef patty, hi-melt cheese, onion rings, bacon and BBQ sauce, before grabbing a side of onion rings, twice-cooked chips, or fried chicken wings. Wash it down root beer, and sweeten the deal with Reece’s peanut butter cups. There’s a reason On It Burgers continues to dominate as one of the top rated burger joints on UberEATS. 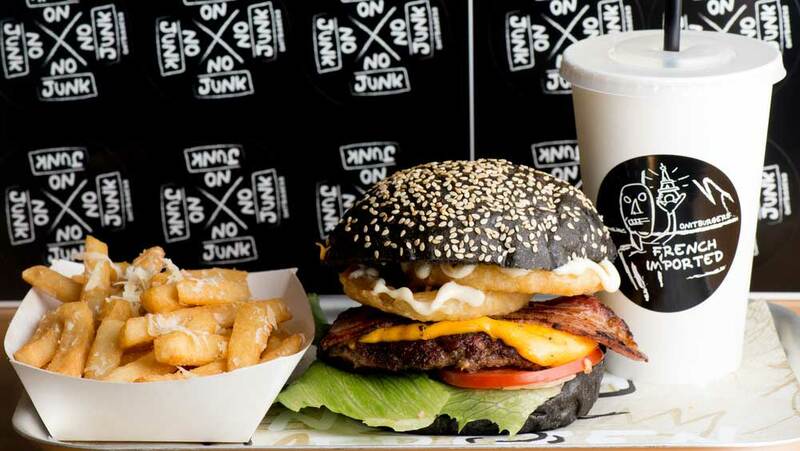 Is it the Instagrammable UberEATS Black Label burger with truffle mayo, served on a squid-ink bun? The smoky chorizo burger? Or shakes in every flavour you can think of? Perhaps it’s all of the above, but it could come down to just two words: bacon jam. Don’t ask- just trust us and order it. Smear it all over your burger, your fries, your mouth. Try out our 5 recommendations for yourself – some of them may surprise you.